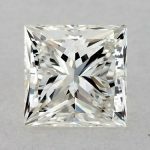 If you have decided to dive in the world of diamond shopping and you plan on being a consistent buyer, then the first question on your mind is definitely whether you should do your shopping online or in the usual walk-in stores. 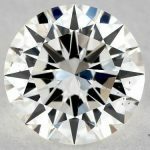 The fact that you’re interested in this post clearly means that you have chosen to do most of your diamond shopping online. The digital jeweler world is dominated by two top merchants; James Allen vs. Blue Nile and we are certain that you have come across these two brands a lot during your online research. Just like the first instance, a lot of buyers are usually confused on which merchant to buy from as both brands have a really strong online presence and an all-around great reputation. Hence, in this post, we will shed more light on both brands while highlighting their strengths and flaws to help you make a more informed decision on which brand best meets your needs. A lot of shoppers base their buying decisions on how long a particular merchant has been in the business. While this might not stand-still in a lot of industries, but there are a lot of shoppers give this advantage to older merchants. This means that a buyer would more likely go for the seller who has been around longer than the new kid on the block regardless of how appealing the marketing strategies of the new business are. This concept also applies in diamond shopping; so, If you are one of such shoppers, then Blue Nile might just be the merchant for you, but in our own opinion, this doesn’t give any advantage or make a win, why? Because being in business for more years than your competitor doesn’t necessarily mean you’re better, I think it counts the other way actually, if a new merchant who joined the business 10 years after you, and then in 5 years they were able to chase you (and possibly pass you), then you should be questioned about that. A lot of industry experts consider Blue Nile (Founded 1999) as more experienced in the market and view James Allen (Founded 2006) as a hip and millennial-friendly business. 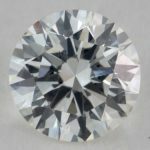 This is mainly because Blue Nile has been around the longest and has become a somewhat household name when online diamond shopping is discussed. However, this doesn’t diminish the authenticity of either brand in any way. 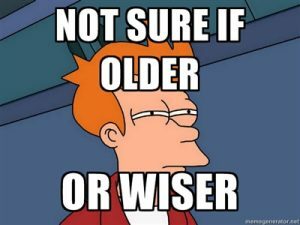 Instead, it points out the fact that they are both highly experienced to different groups of shoppers and this affects their overall buying decisions. Most shoppers would rather not buy anything online because they won’t be able to see the product physically in person. However, the world of digital shopping has grown massively over the years, and shoppers can now have an in-depth view of products from different angles to give them a clear idea of what the product will look like physically. 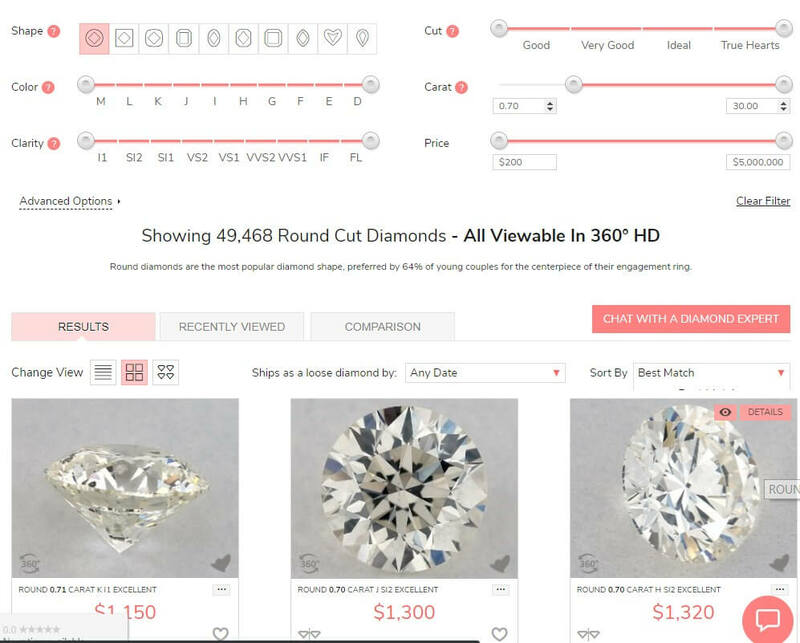 Digital shopping technology has made it pretty easy for shoppers to look at the magnified images of diamonds and know exactly what they are ordering. When shopping on Blue Nile, a comprehensive list showing all Diamonds 4Cs parameters of a particular diamond is laid out. This way, you are certain of the Cut, Clarity, Carat, Color, and other details of the rock you want. 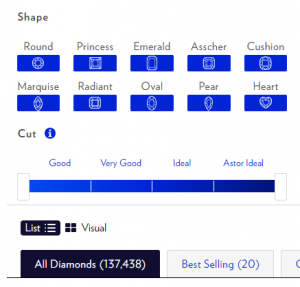 Unfortunately, on Blue Nile, you are not shown a preview picture of the diamond you want, except for special cases; like if you chose a custom diamond, in which case, you will be provided with just two small photos of the item. 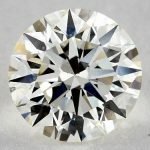 Update: Later 2016, Blue Nile knew that although they are the leading and the largest online diamond website, they are way behind other competitors for lacking real images feature on their website, when you shop for a diamond, you barely trust an HD real photo, how about trusting a website without seeing an actual photo? That was a big problem for Blue Nile, so they introduced 360° Diamond View for all their diamonds, where you can see the real diamond in 360 degrees technology. On the other hand, James Allen makes 360° real life images of each item available for preview. All shoppers have to do is hover around the image, and they will be able to see different angles of the product. You can also click on particular areas of the rock to see a magnified (up to 40X) view of the diamond. This enables you to have a pretty accurate view, and impression of the particular rock you want and helps you make better choices of which diamond to purchase and which ones to remove from your shopping cart. It is therefore obvious that the shopping experience on James Allen supersedes that of Blue Nile. This is because while shoppers are just given standard information of the products without an actual magnified image on Blue Nile; James Allen offers its customers a full and intense look at the product and the magnification options lets them see all the details that don’t appear on the certificate they would have missed if they were just looking at the basic information of the product or just a static image. 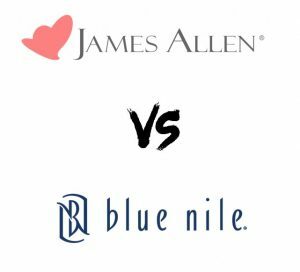 Blue Nile has one advantage over James Allen in this, they do have a mobile app while James Allen still doesn’t have one, weird! Honestly, this changes a lot, and James Allen is running all the way to compete with Blue Nile in inventory. 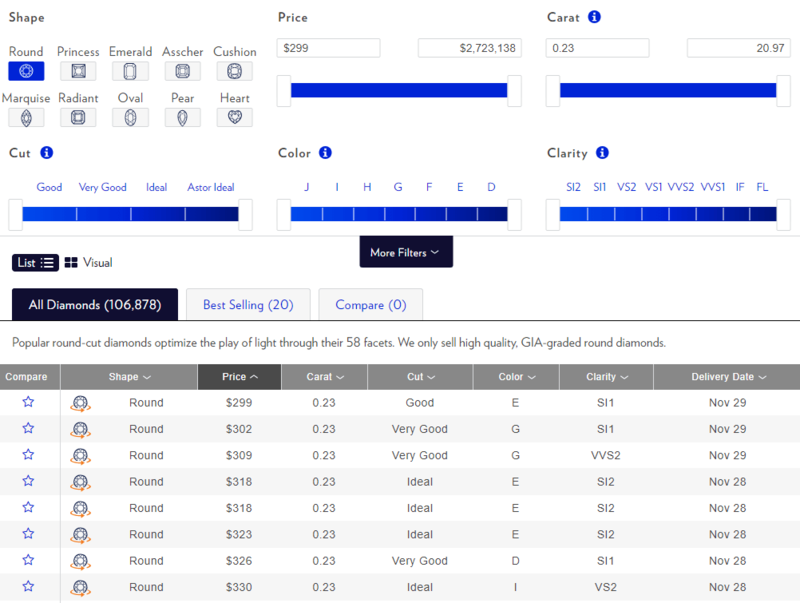 Blue Nile is well-known on the web for having the largest inventory (while it’s not confirmed officially), but the last time I checked their diamonds page, selected all options available, I found around 137000 diamonds as in the image here, while in a most recent email I got from James Allen (July 2018), they confirmed that they have passed 200000 diamonds in their inventory. If you want to get a small diamond as a wedding gift or just something for yourself, then Blue Nile is riddled with a lot of great and highly affordable options you can choose from. Also, Blue Nile has a lot of great pre-set options to choose from and custom options in cases where you would want to add a personal touch to your diamond or design your diamond ring. They also have a lot of pearls and gemstones that you can add to your design. 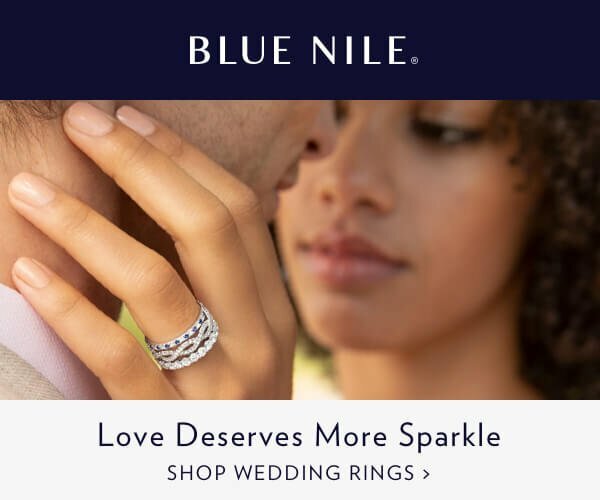 One thing to mention here, Blue Nile business model is drop shipping, they don’t actually have all the diamonds on their inventory, actually they have very much little of all the diamonds listed, we’ve discussed this in details in Blue Nile Review Article. However, when it comes to buying diamonds, quality definitely supersedes quantity, and you would feel a lot better about your purchase if you could see magnified views of them before payment. For the sake of staying safe, since both merchants’ inventory change a lot, we will give a tie in this. 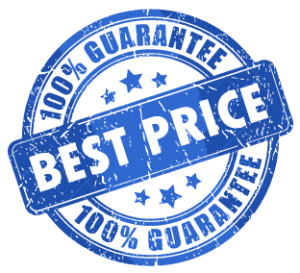 One of the top reasons why these two brands are in the top of their niche is because their prices are extremely affordable. These brands make owning quality diamonds a very achievable goal even for the masses. However, if we had to pick a brand based on cost, then we would have to go for Blue Nile due to their high level of affordability and a massive pool of options (keep in mind the drop shipping model we’ve mentioned above). 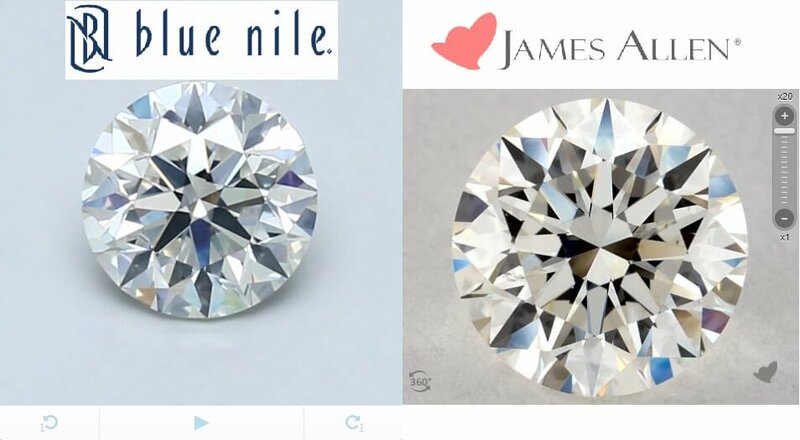 Also, we will have to point out that the price difference between the items on Blue Nile and that on James Allen are not that large, but if you are focused on getting discounts regardless of how small then this information would be very useful to you. To further reel in new clients, Blue Nile created a Diamond Price Guarantee clause that enables shoppers to get a refund of the price difference of diamonds in cases where they buy a diamond from their site and find the exact diamond at a lower price someplace else. However, terms and conditions do apply for this to be affected, and you can’t win it all the times, read this section in the Blue Nile review article for details. Until this moment, James Allen doesn’t provide this feature. To be honest, I don’t see this feature a great win for either, every diamond is different, you can easily find 3 exact diamonds: Cut, Carat, Color, Clarity, Symmetry, Fluorescence, you name it, and still; each one is priced differently, because diamonds in nature aren’t identical. 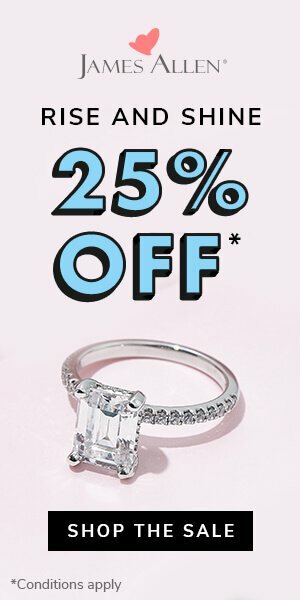 You might get a diamond or a ring, then change your mind for some reason, or you discovered that you need to resize the ring, James Allen gives you a hassle-free 30-days free returns, and a good service that offer you 60 days free resizing, free engraving as well is available in checkout. Blue Nile does provide 30-days free returns as well, and a whole year of free resizing (this is cool actually if you bought the ring a bit earlier), but they do charge around $25 for engraving. Buying a diamond is not like going into the store and picking up a new bag or can of tomato paste. Most diamonds do not come cheap; therefore it is natural to have a lot of questions when trying to purchase one because you want to be a 100% certain you are putting your money to great use. 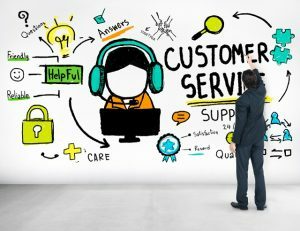 This is where customer service comes in as the representatives of each of these brands will likely be the ones to give convincing answers to your pool of questions. James Allen prides itself in offering 24-hour customer service assistance, 7 days a week regardless of your location in the world. Their response time is not more than 30 seconds, and they provide customers with ASET analysis on fancy diamond pieces multiple times for free. James Allen, however, doesn’t give the option of diamond reservations anymore (Update: They do for some cases, give it a try in case you’re still not sure about your selection). Blue Nile also has a very dependable customer care service with a very fast response. The downside, however, is that they are not available all day long and do not give out free ASET analysis. Also Blue Nile’s customer service gives customers the option of reserving a diamond for up to 2 days or 48 hours. Once this reservation is made, the diamond will be taken off their website, and customers can easily call to make payment within the stipulated time frame. While it may vary from one to another, a quick look on the packaging for both merchants shows that James Allen takes more care of this, beside the nice packaging, the diamond comes with a large box that can be used as an elegant jewelry box, they also provide a cleaning cloth to keep your diamond shines all the time. A lot of people would rather go to the pioneer company of a particular industry because they feel safer and more comfortable with their services regardless of the existing shortcomings. This is one of the main reasons why a lot of people would rather shop with Blue Nile as they have been in the game for the longest period of time. 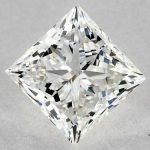 However, if you are very selective when it comes to diamond shopping, then You would be at peace while shopping on James Allen as you will be given a clear picture of what you are ordering, actually we’ve created a whole post to review James Allen by itself, without comparing it to any other merchant, feel free to check it. 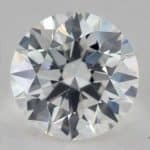 So for us, we would definitely make James Allen our merchant for all diamond purchases, and this is solely because of their impeccable customer care and the image preview options on their website. Some people just love to have a very clear view of what they want to buy, and if you are one of such people, then we think James Allen will be your choice too. So, we’ve made our choice; we would really love to hear yours and why! 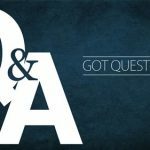 Still have any question? Please drop us a comment or contact us directly.